It doesn’t seem like much of an accomplishment, but I got the dovetail joint for the seat cut and fit yesterday afternoon. I spent some time sawing practice joints first on a tick scrap of Sapele. My LN dovetail saw didn’t quite reach deep enough, and it was a lot of sawing — but the cut was crisp and arrow straight. 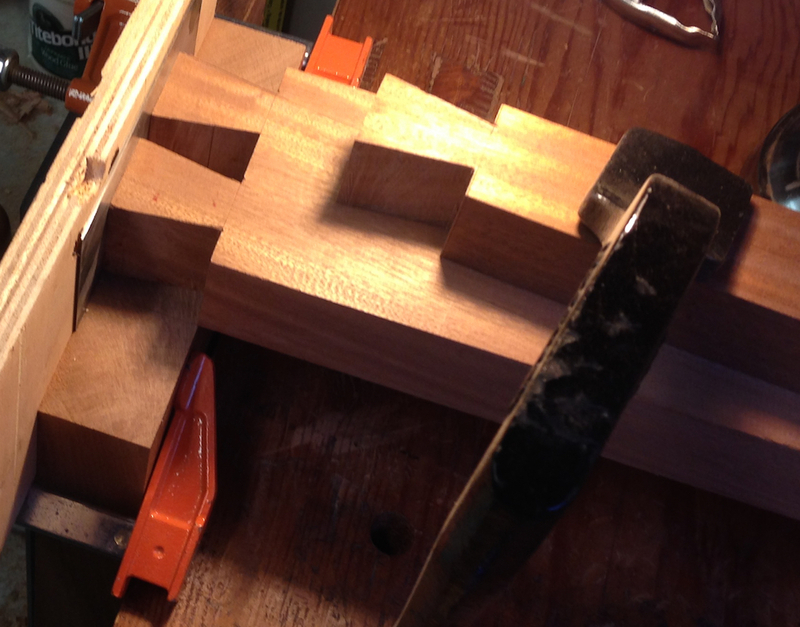 I decided on using my nearly-new Bad Axe 16″ tenon saw and made a bunch of practice cuts to get my arm tuned up. 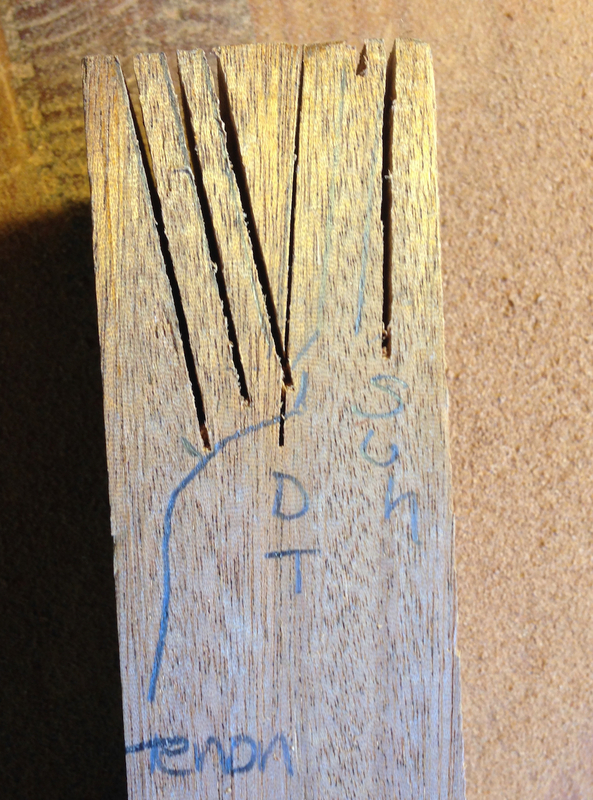 While I was sawing the cuts I noticed that the saw seemed to want to wobble in the kerf. When I checked the saw the plate was “loose” or “floppy” along the toothline. Not good. I set it aside while I laid out more practice lines, and then noticed that the wobble was gone. Almost like it was heat related. I made another cut and it came back. Crud. I bought this saw a couple of years ago, but I’ve hardly used it at all. I emailed Mark at Bad Axe and he suggested that the saw plate needed to be reseated in the folded back, so I’m going to try that today. Beautiful saw, hopefully Mark’s retensioning (http://www.badaxetoolworks.com/retension-a-backsaw.php) advice will resolve the issue. I sawed out the tails and checked them for accuracy. There were a few spots where they weren’t flat and a couple of areas where they were slightly out of square with the face of the board. I pared out all of the problem spots and jury rigged this setup to transfer the tail layout. If you are particularly observant you’ll have noticed the scraper between the end of the tail board and the plywood alignment stop. 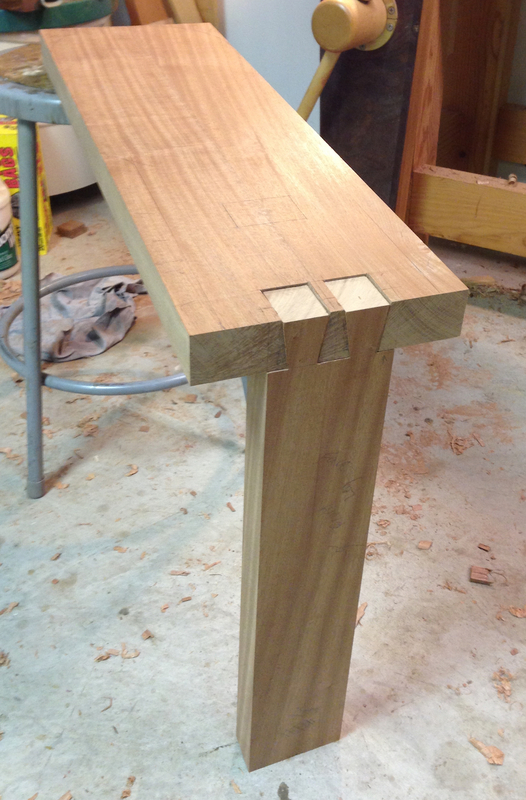 Somehow I had the baseline for the dovetails about 1/16″ too shallow. That means the end of the tails won’t reach the face of the seat. Not a structural problem, but a little annoying. I’ll have to check the thickness of the seat, maybe I didn’t finish it to the right thickness, that would be an easy fix. I sawed and chopped out the pins, and got the joint mostly fit up in time for dinner. There is a little tweaking left as one side isn’t seating completely yet. I’ll deal with that after I get some coffee. The rest of the joinery on the seat should go more quickly. I’m on the fence about whether to do the work by hand or use power tools. I’m leaning towards hand tools, if I can re-tension the saw plate on my tenon saw I can practice sawing the tenons, and if they are not perfect it isn’t a huge deal as I haven’t yet convinced my wife to put the Chevy in the living room. We’ll see. The joint looks good. As to the living room situation. I find find that begging forgiveness is almost always better than asking permission. Be a man and show some initiative. LOL If nothing else I can live vicariously through you. Plus, I’m a few thousand miles away so there is little fear of your wife tracking me down and smacking me. Double ditto on what Greg wrote. Ralph, you’ll be pleased to know that the Thorsen cabinet replaced the framed poster on the wall this weekend.